My hands are shaking as I bring to your attention best buddies 12-year-old JASMINE (A1751690) and 10-year-old SARABE (A1751691). 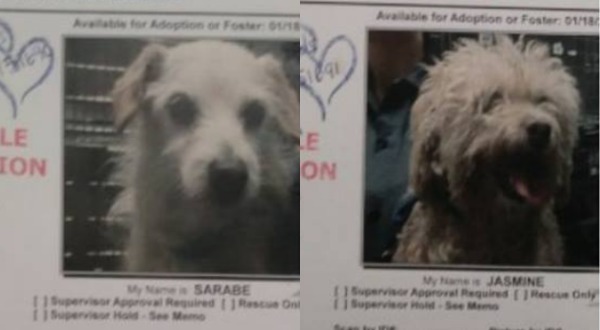 Both rather neglected-looking dogs were dumped yesterday at the East Valley shelter because they are old and the couple wanted a younger dog. Sure enough, the [in]humane couple showed up this a.m. and bid on and won a puppy that they didn't even meet. And, get this, they named the puppy Jasmine. What a pity for the puppy. Please come and rescue/adopt this bonded pair. The shelter is at 14409 Vanowen St., Van Nuys, CA. Please NOTE: When I posted this story, I had no idea it would garner the comments and shares that it has received. Your passion to see justice done to people who abuse/neglect innocent animals is understood. However, taking your frustrations out on the people who work in the shelters is misplaced. Unfortunately, there are few, if any, laws enacted to protect our pets, and many people still consider them to be possessions to be disposed of on a whim. Shelter employees have policies and protocols that they are required to follow, which include they cannot turn anyone away when a pet is being surrendered, and they cannot discriminate as to who can adopt a pet. It's a sad reality, and trust me, staff is often as traumatized as any of us when they have to deal with situations, such as the one presented yesterday. As a volunteer who goes to the shelter almost daily and witnesses some of the pets being surrendered, I, too, have to restrain myself or I may end up going to jail. At least I can't be arrested for my wishful thinking of what should happen to the irresponsible pet owners. So, pleeeeease stop criticizing the shelter employees for doing what they are required to do. The next time there is a mayoral election, search for someone to run who is forward-thinking and is willing and able to bring changes to the shelters, and who cares about the well-being of the animals. Thank you for reading this and for understanding that the most important thing is to get these two dogs, and so many others, in to safe and loving homes. 0 Response to "Bonded neglected-looking seniors were dumped because they are old and the couple wanted a younger dog"